When traveling to new a place trying the local fare is always at the top of my list. 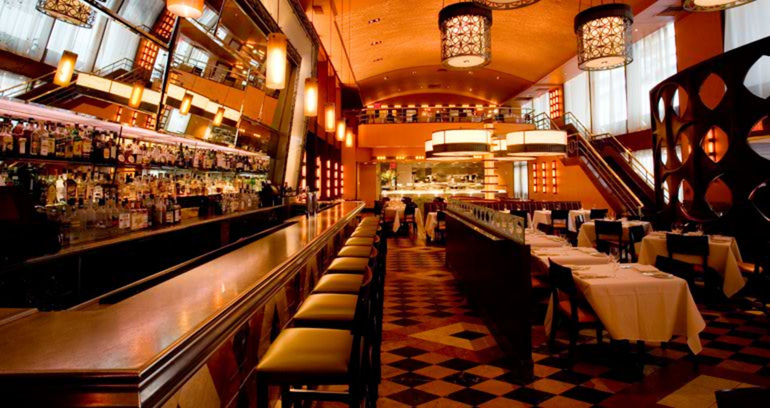 So, in a recent trip to New York City (one of my favorite places in the world) I had a real hankering to make my way to one of Bobby Flay’s restaurants. Not only had I admired his food from afar after countless hours of watching the Food Network, but truth be told he is my celebrity chef crush. After some thought, I decided on Bar Americain, which as you probably guessed is American fare combined with the robust flavors that Bobby is known for. The restaurant offers that classic brasserie feel with pressed white linens and bold architectural elements like the oversized light fixtures that descend from the ceiling. The low lighting gives it a swanky feel without being pretentious. Its ember colored décor also greatly contributes to the warmth of the restaurant. Entering Bar Americain I swelled with excitement. Since I was traveling solo I decided to dine at the bar where I could enjoy the full menu, and make some new friends in the process. First order of business was to befriend the bartender, because they are just generally good people to know. He was a true mixologist and made me a variety of drinks that weren’t even on the menu based off my tastes. The concoctions were dangerously good, and before that night I didn’t think I even liked gin, but like many things, done right it can be really enjoyable. another time), and I think you can tell a lot about the quality of a restaurant by them. This one did not disappoint. It had a real down-home feel with its crusty dinner rolls and warm cornbread, which might have been my favorite part. After gorging myself on bread I decided to order the grilled pizza with double smoked bacon, caramelized onions and toasted garlic. I come from the school of thought that everything is indeed better with bacon, and this is no exception. The char flavor from the grill beautifully accents the thin crust, while the caramelized onions and smoked bacon marry together to give it a sweet and savory taste. It is a more upscale pizza that packs the flavor. Of course my trip wouldn’t have been complete without a bit of randomness. Of all the people I met at Bar Americain that night, my favorite were these two ladies who had come to grab a drink after an evening at the theatre. I wasn’t quite sure about them at first, but after a couple drinks we really started bonding (as what tends to happen). The one lady was Italian and the other was a slightly ridiculous blonde woman with a lot of opinions – both informed me they had kids about my age. They told me how I should really live it up while I was in New York, because my youth would soon fade and I wouldn’t always be desirable (I am sure very sound advice), and they lamented about having reached middle age. LOL. Only you would meet fun, random people like those two ladies, boo. 🙂 Miss you! The story is even better than written above, but got to keep it classy for the blog. 🙂 I miss you too! And thanks for being such a supportive reader. Thanks for stopping by Aristotle! Nice meeting you the other night. I simply want to mention I am all new to blogging and actually loved this website. More than likely I’m likely to bookmark your blog . You actually have remarkable well written articles. Cheers for sharing your webpage.